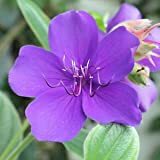 Tibouchina growing shrub‎ or small tree of the genus Tibouchina also known as Glory bushes, Tibouchina perennial evergreen used as ornamental plant hedge plant, can grow in tropics, mediterranean or subtropical climate and growing in hardiness zone 10b+. Leaves color green silvery the leaf is hairy in some of the cultivars with elliptic shape. 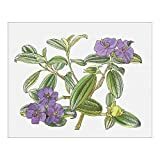 Flower color purple with five petals, can grow in clusters or alone.